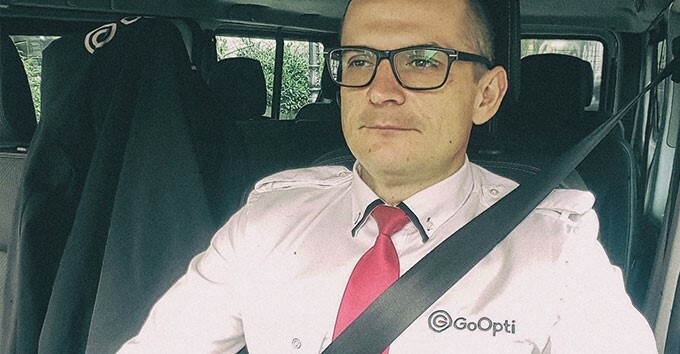 Medo and Andrej – GoOpti drivers with many years of experience. Two untamed souls who have chosen life on the road. Each of them with his own repertoire of gobsmacking stories. Here they are to share them with you. Airport Ljubljana. In about an hour and forty-five the plane from Istanbul will land. A GoOpti van is already positioned close to the arrivals terminal, and the drivers are standing at the terminal entrance, dressed in elegant uniforms, patiently waiting for their passengers. There's still time for coffee. Andrej Laurenčič and Uroš Medved sit down at the table and in the next moment we enter into the exciting world of driver stories. 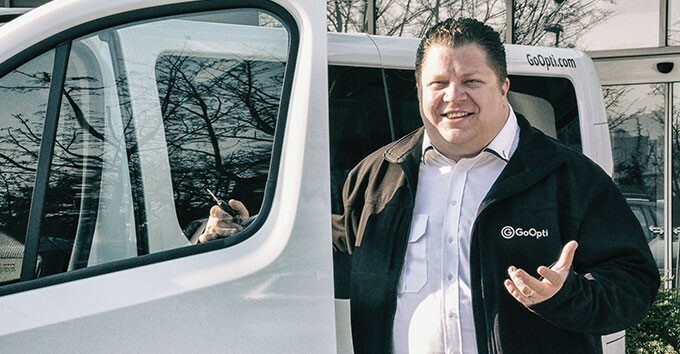 You spend your days behind the wheel, and meet a wide variety of people. Surely you remember some passengers who left their particular mark. Do you recall any of them? Medo: It was a unique experience. Amazing people. They even provide us backstage tickets, which was a really crazy experience to see all these behind the scene 'machinery'. Medo: I also have a very fond memory of an Italian film crew. I was driving them around Slovenia’s spa centers for four days. Great people - interesting, fun and friendly. They treated me like a member of their team and invited me every night to join them at dinner. What is the best thing about being a driver? Medo: That you're your own boss, you are independent, surrounded by people and constantly in motion. Andrej: The things I appreciate most about my profession are variety and diversity. Each day is different. Every passenger who travels with you, tells you something new. For example, I had never been to India or Thailand, but when I hear stories of people who come from there, I literally can imagine those places, as I was actually there. It's great. I enjoy being on the road, although I am open to new things. I can imagine doing something else, but only if the work was varied, interesting and in connection with travel. Great, this is the good side of the driving profession. What about the dark side? What is the worst drivers' nightmare? Andrej: Fog! In case of fog nothing can help you, not even extensive experiences or excellent driving skills. The only thing you can do is just to be very, very careful, and hope that this same attitude is shared by all the other participants in traffic. Which destination is you favorite? Andrej: I love Bologna. I like to drive there. Otherwise, every destination has its own specifics. Would you like some advice? On the road between Padova and Bologna be prepared to encounter fog, in Trieste avoid beginner drivers (they have a big L sign on the rear), in Milan pay special attention to the drivers of scooters. Oh, there are scooters all over the place. And when driving in Milan try not to stop. It can be scary to drive there, but don’t ever stop. Just drive carefully and find your way forward. Sounds good. For conclusion, tell us what are the driver's secrets. What are you drivers doing when there is no one around? Medo: While I’m waiting for the next ride I go fishing! Yes, that’s it. I am a passionate fisherman and I know all the places where I can combine business with pleasure. When I drive to Malpensa Airport, I go fishing in the river Ticino. In Bologna I fish in the lake Rosario. I borrow there the fishing gear and enjoy! Andrej: When we are waiting, we usually watch movies on tablets or laptops, read, or take a stroll through the old town. One of the most beautiful old towns for me is certainly in Bergamo. I personally love music. When there are no passengers in the van, I play the music I like in that moment, increase the volume and sing along. My favorite song while driving is Bohemian Rhapsody by Queen. Sometimes I play it quietly, even when passengers are in the van and I can tell you that each time there is someone who starts to sing quietly while all the rest are at least slightly shaking their heads to the beat. There is nothing better than a good atmosphere while driving. The voice through the speakers announces the landing of the plane. Medo and Andrej gently adjust their uniforms and step toward the collecting point. There they will welcome new passenger on board of the GoOpti van and start a fresh chapter of adventures. The air is filled with excitement. The charm of travelling is precisely to never know what's waiting around the corner. Take a chance and experience new adventures! Book your GoOpti transfer now!